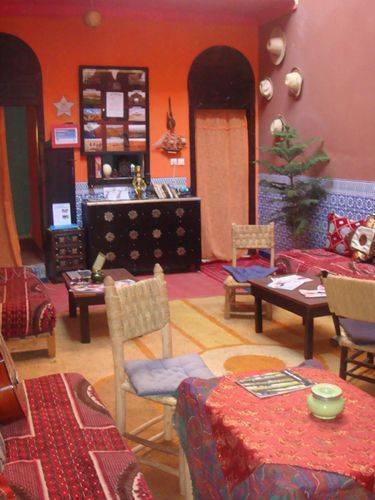 Hostel Riad Mama Marrakech is a warm friendly place that welcomes travelers and backpackers, ages 18 and over, from all the far corners of the world. We have a tremendous amount of experience in the hospitality industry. Collectively, we are native English, French, Arabic and Spanish speakers so we can understand what travelers need during their stay in a place that may or may not be familiar. As our guest, you can relax on our beautiful garden terrace and drink free mint tea all day if you desire. If you are feeling social, mingle with other guests listening to music in our comfortable ground floor salon and even feel free to cook yourself a meal in our kitchen, using the wonderful spices you may have just gotten from the Souks. We can also help you set up the adventure of your life with day and night trips to other cities… Go to the beach for the day in Essaouira, take a hike on the trails and waterfalls in the mountains of Ourika Valley or even go camel riding and spend some time in the Sahara… After a few days of adventure, you may want to relax, come back to Mama Marrakech and sense that this hostel is your home away from home. We desire that you to feel that this experience is one you want to tell your friends about or feel safe enough to come back alone, because you are a part of our extended family! Our Award winning staff creates an atmosphere that is authentic and comforting for travelers. 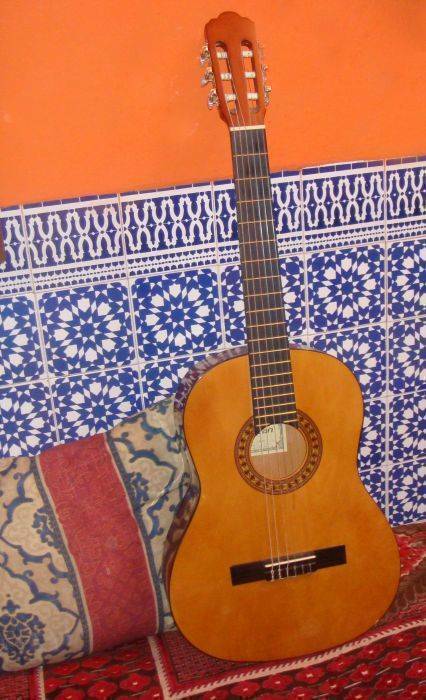 All types of music can be shared over the speakers throughout the hostel. We have instruments and our guests share their talents with one another as we hang out on the terrance for sun bathing or build beautiful fires in the evenings for the guests to sit outside when it is cold. We have random dinners of amazing Moroccan cuisine for new guests so that the clients really get to know one another, sharing their experiences in a large open Moroccan decor salon. With large dorm rooms including a dorm room with a bathroom ensuite, free breakfast and a warm and welcoming living experience, it is our desire that our amenities make each client feel like Mama Marrakech is their home away from home! All dorm rooms are comfortable, brightly colored and named after music legends displaying cool pictures and paintings of the artists that the room is named after. Three of our four huge dorm rooms have six single beds, tables, coat/ towel hangers and lockers. One dorm has 5 beds and a bathroom ensuite. 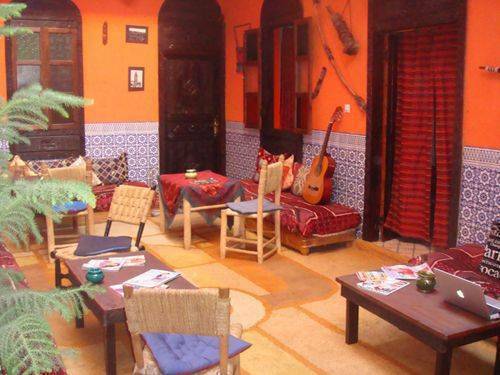 All the rooms are designed in true moroccan style with low salon styled beds and matching tables to make the guests feel comfortable and not crowded with too many people sleeping above and around you. Our rooms are set up for maximum comfort. There is a bathroom on every floor a few feet away from the dorms that has 24 hot showers, European style toilets and large wash-basins. Towels and all linens are free. Our hostel is very easy to find in a comfortable area and very close to banks, pharmacies, restaurants, Western Union, boutiques, and many different types of shops. Anything that you, as a cultural traveler, could possibly need is within a very short walking distance from our location. Currency due on arrival can be excepted in Dihrams, Euros, Dollars and Pounds. All change will be given in MAD. We require 48 hour notice for cancellations. All payments are due on arrival. 1)	From the main square Plaace Jemaa El Fna walk toward the main exit that is where the horse and carriages line up on the left and Club Med is on the right with the Mosque Koutoubia in front of you. 3)	Cross the street and walk on the left side of the street by café Koutoubia. 5)	Continue straight and make the first left. Mama Marrakech is located at the left side at the end of that small street, on the corner. (Number 18) You can ring the doorbell. Your Welcomed. For first time travelers to Marrakech we suggest our service for airport, train or bus pick up for our flat fees. Our drivers will wait for you at your emailed arrival time and bring you to the door. 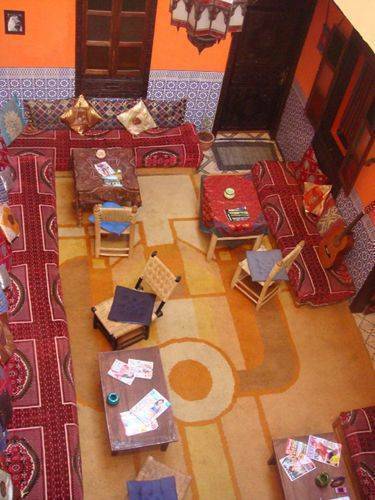 Our hostel is conveniently located near Place Jemaa El Fna and the Mosque Koutoubia where taxis and buses are readily available and we are also walking distance from Gueliz (New City) where transportation like trains, CTM Buses and Supatours Buses are located. 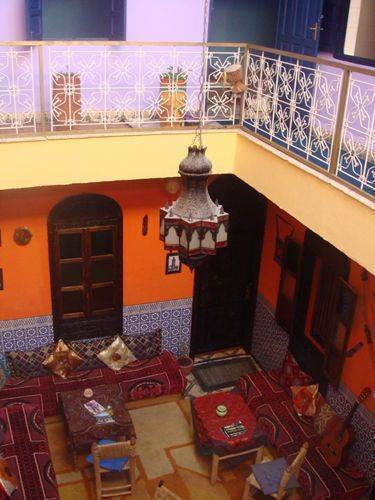 Nearest airport: RAK Marrakech Menara Airport is located 30 minutes away from the hostel outside of the Medina area.